Running numbers: 3600 - 3630. 1902 (3601 - 3620) to lot number 134. 1903 (3621 - 3630) to lot number 143. 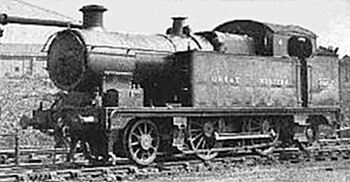 The 2-4-2 configuration was unusual for the Great Western in that only one previous locomotive had been built to this arrangement, number 13. The design resembled the Lancashire & Yorkshire Railway's Aspinal tank with it's large side tanks, inside cylinders and radial axleboxes for the carrying wheels. A prototype, number 11, was built in 1900 and fitted with a shortened version of the 'Bulldog' parallel boiler. Steam operated reversing gear and water pick-up gear was used enabling water to be picked up in either direction, however while the engine was picking up water at Rowington, it did so with such a force as to split the side tanks open. Larger vents were fitted to the side tanks and bunker tank to alleviate this problem. One advantage of the design was the ability for fast running in reverse as well as forwards as large rear windows were fitted to the cab, but it was soon found the these windows were susceptible to breakage when the bunker was being filled and so smaller windows with vertical bars were fitted. The prototype ran on various workings between Birmingham and Wolverhampton and Leamington Spa for two years before the design was deemed a success and orders placed for another 20 engines in 1902 with an additional 10 in 1903. Due to the high arched cabs, these engines were known as 'Birdcages'. The boilers were all eventually replaced by the Standard number 3 taper boiler with superheating and top feed. Three types of chimney were tried, the original was a small cast iron taper design to be replaced by built-up copper topped type in 1907 which was superseded by a short design on sixteen of the class, similar to the '5600' class chimney. The steam operated water scoop was replaced by a hand cranking fitment in 1905 until the water scoops were removed altogether in 1921. Due to the lack of useful work for the design, the first of the class to be withdrawn were numbers 3612 and 3630 in October 1930 and the last four members were all withdrawn in November 1934.